Last year, ABC launched a new TV show called The Great Holiday Baking Show which was based on a series. 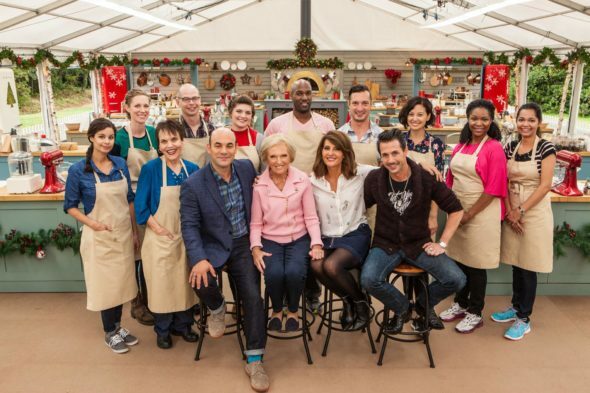 The ratings weren’t great but the network renewed it for a second season with a new name, The Great American Baking Show, and twice as many episodes. Will the numbers improve this time around? Will this series be renewed for a third season or, will it be cancelled instead? Stay tuned. On The Great American Baking Show, a group of the nation’s best amateur bakers compete in a series of themed challenges and eliminations. Their goal is to be crowned America’s Best Amateur Baker. The competition is hosted by married actors Nia Vardalos and Ian Gomez. The judges are Johnny Iuzzini and Mary Berry. 1/13 update: You can see the latest night’s ratings in context. Last year comparison: The first season of The Great Holiday Baking Show averaged a 1.03 rating in the 18-49 demographic with 3.97 million total viewers (live + same day ratings). What do you think? Do you like The Great American Baking Show TV series? Should ABC cancel or renew it for season three? Sad to see the show pulled from the air – had just recommended it to several friends. I had a feeling we would see men just dropping out of sight from all businesses amid the new awakening. Perhaps our granddaughters will not have to be harassed………. This is really a great show… I can’t believe how talented those bakers are… & doing it all from a tent! Please let know when The Great American Baking Show will air again. I watch it when it was the great British baking show and loved it. I was thrilled when it changed and aired as the great American baking show. When will season 3 begin for the Great American Bakng Show? Love this show!!! I loved this show and am glad I “accidentally” stumbled upon it after stumbling upon the U.K. show. With all the junk on TV, this was truly fun and inspirational. Made me want to get back to baking! Please renew it!!! Mary Berry’s charm, the contestant’s positive attitudes, and the hosts’ playful attitudes is a good-enough replacement from the full-on British version everyone loved. I do miss Mel and Sue, but the American hosts are getting more and more loose and fun, as the shows progress. 🙂 KEEP IT UP!! My husband and I both enjoy this show. We have been wondering where it is filmed? Would love to see more seasons.